Today we begin a series of articles devoted to various sea caves (not underwater ones) we can find in the Costa Brava rocky coast. And we could not start without visiting the longest and most spectacular of all: Cova d’en Gispert, in Begur. Cova d'en Gispert, in Begur, Girona, Costa Brava. Author: Josep Castelló. Cova d’en Gispert, we insist, is the longest sea cave that can be found on the Costa Brava. It is located among Aiguaxelida and Aiguablava coves, in Begur. One of the best ways to reach the cave is by kayak, leaving from Cala Aiguablava (in summer are usually hired on the beach), or from Aiguaxelida (here certainly you will not find this service, it’s a natural cove). 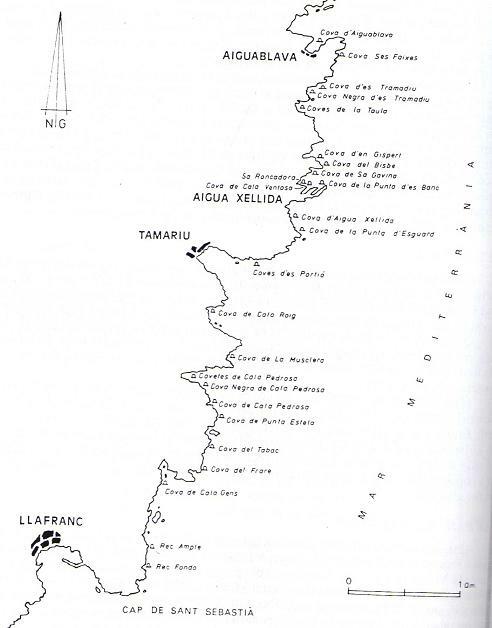 If you are interested in a longer trip you can start from Tamariu (the next beach south to Aiguaxelida, here you can also rent kayaks) or Fornells (north of Aiguablava). They all belong to Begur municipality. In any case sailing or just kayaking the rocky coast between the points mentioned is a true pleasure and really impressive. We are facing a coastline formed by granite walls, some with a pink color tone, some of them up to 50 meters high. In this stretch of coast, in addition to the Cova d’en Gispert, we can find another caves, such as the Cova del Bisbe, where you can also come in. The cave has a length of almost 150 meters in total. Although the entrance is not really wide, you can cross it with your kayak and arrive to the end. The entrance is always visible from any point of the cave, so there is no possibility of getting lost, because the trajectory of the cave is straight. We distinguish two different parts in the total length of the cave. In one of the parts there is the gallery, which occupies the first 93 meters from the entrance of the cave. 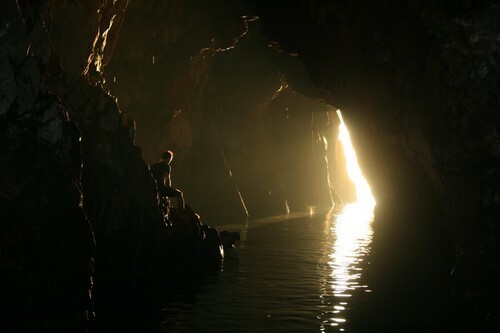 In this section the width of the cave varies between 3 and 8 meters, while the distance from the ceiling on the water level varies between 7 and 10. The depth also varies between 4 and 8 meters. After passing through a sort of portico we enter the final room, which surprises us by its magnitude, about 28 meters by 19 meters, with 22 meters high. The center of the room is occupied by a small island where there is the so-called “Taula”(table), a flat rocky surface on which we can even sit. However, some meters before the gate opens a branch about 10 meters long, which allows also underwater passage to the final room. 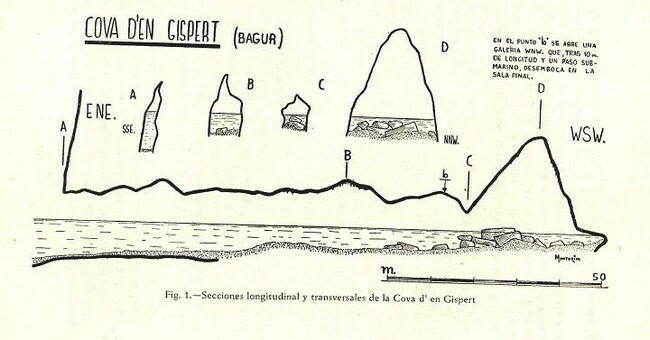 Cova d’en Gispert has aroused passions among many visitors. Probably the most famous reaction was that of Salvador Dalí. Deeply impressed by its interior acoustics, the surrealist genius organized a private concert singing inside it, in the 60′s, probably in the final room. But that’s not all. Cova d’en Gispert provides for two days a year a happy coincidence when the sun enlightens the interior completely, so that the sun’s rays reach the end of the cave, up the hall. This phenomenon is called “Awakening of the sun in the Cove d’en Gispert,” a happy astronomical coincidence that usually occurs approximately on 21 and August 22 of each year. 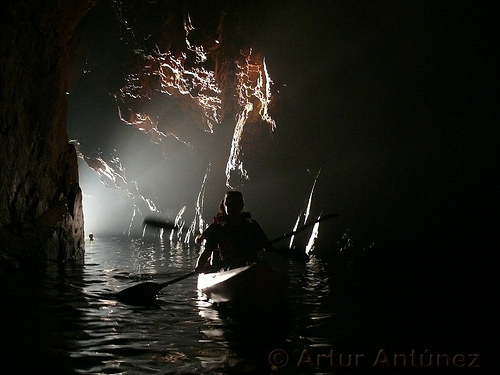 During these two days sunrises kayak expeditions are usually organized by kayak groups in order to watch from inside the cave the entrance of the sun’s rays… and the full enlightenment of the cave. Only those who have had the opportunity to experience it know the emotion of this moment.